Listen to our discussion of the episode here. If you’ve listened to the podcast of this episode, you might notice that Shane and I strongly disagreed over the humour of a key scene from “Slow Dance.” We write, of course, about Rick’s funeral scene, when the customized black metal coffin with long bits of metal sticking out is being brought in, and slowly, ever so slowly, people start to titter, and giggle, until the whole church erupts in uproarious laughter at the end of the scene. But let’s take a step back and examine the situation. 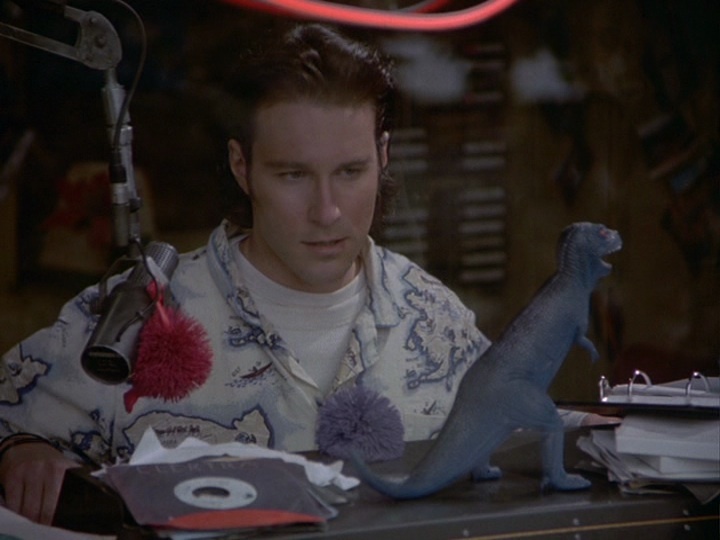 The show kills off the well-liked recurring character, Rick. 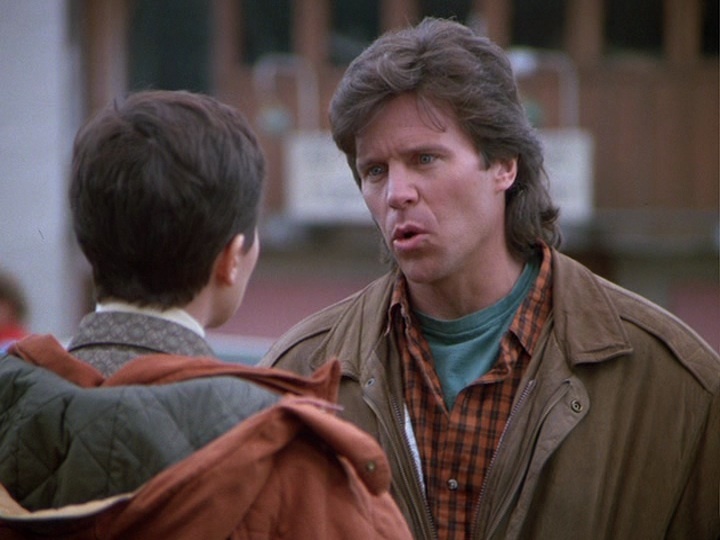 In previous episodes, he had been portrayed as an easy-going, laidback, outdoorsy guy (in a great performance by Grant Goodeve). By all accounts, this should be a sad episode, because for the first time someone we’ve gotten to know on the show has died (previous deaths have been minor ones: Soapy Sanderson from 1.3, who we see only for about 5 minutes, and the unknown man from 2.3). We have seen the show deal with death in a serious, mournful way in “All Is Vanity,” where residents attend a funeral pyre and see their own mortality reflected in the stranger. It is definitely more challenging to venture in the path of comedy when it comes to death (Maggie is literally told of Rick’s death via a joke). But that’s what makes the show so good – the fact that it takes risks, and assumes that the audience will rise up to the material (instead of the material ‘dumbing’ down to viewers). But let’s break it down: how does the episode prepare us for the mournful levity that is to come? In the second season, Rick has been noticeably absent. 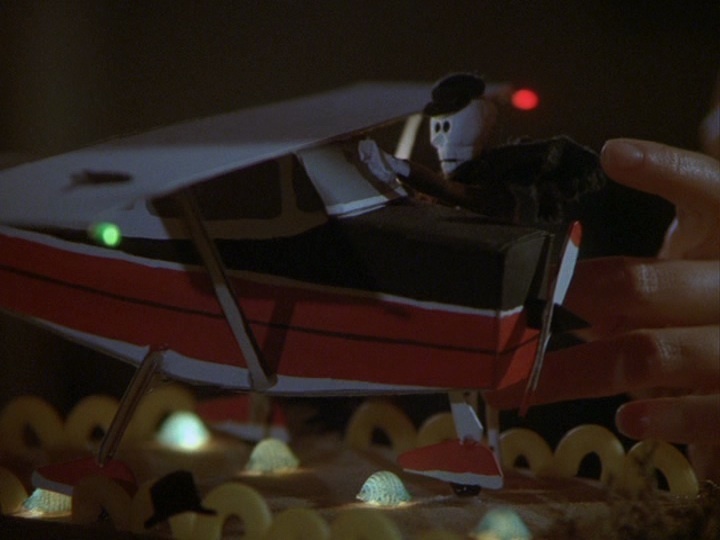 His only appearance prior to 2.7 was in the first episode “Goodbye to All That,” in a very brief scene at the Brick (he is only glimpsed while with Maggie, and doesn’t even have a line). However, even though we rarely see him, he is still very much there: Rick is mentioned as being away in “The Big Kiss” (says Joel: “…remember him? Big guy with landing gear for brains?”), “All Is Vanity,” “What I Did for Love,” and “Spring Break.” He is there and not there. Viewers know he’s still in the picture, but they’ve gotten used to him not being around. The episode subtly prepares us for Rick’s demise. 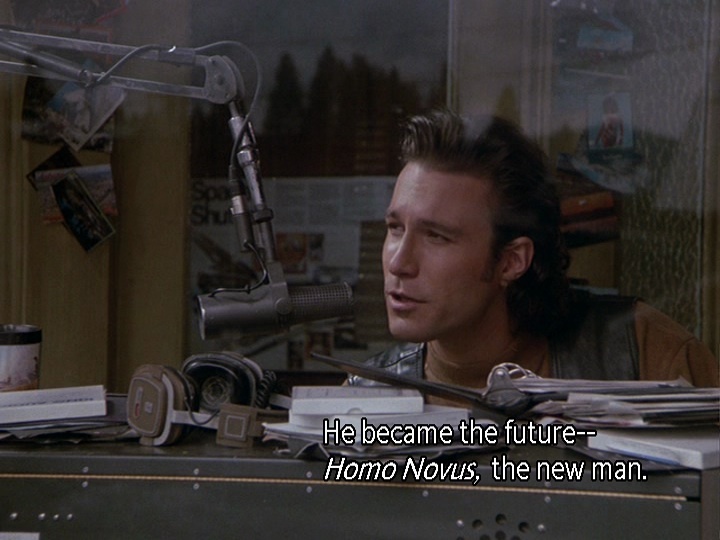 In retrospect, many elements in the early part of the episode serve as foreshadowing for the death. 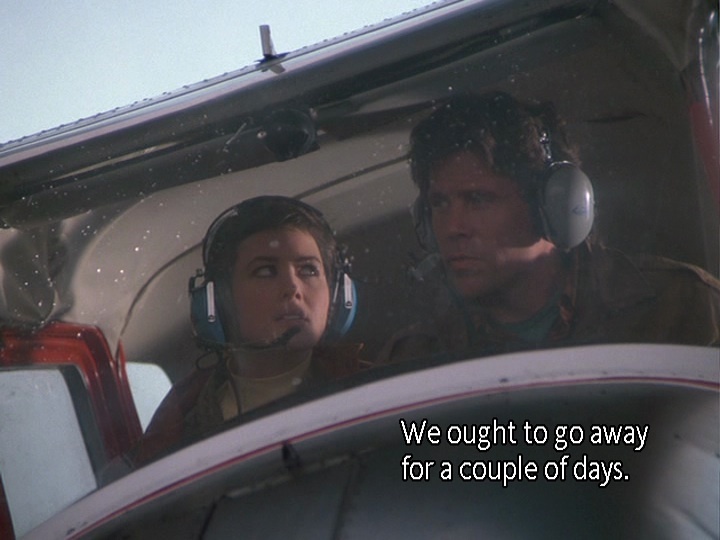 – Maggie reports Rick’s colorblindness to the FAA, in part for her fears of Rick getting into a flying accident. 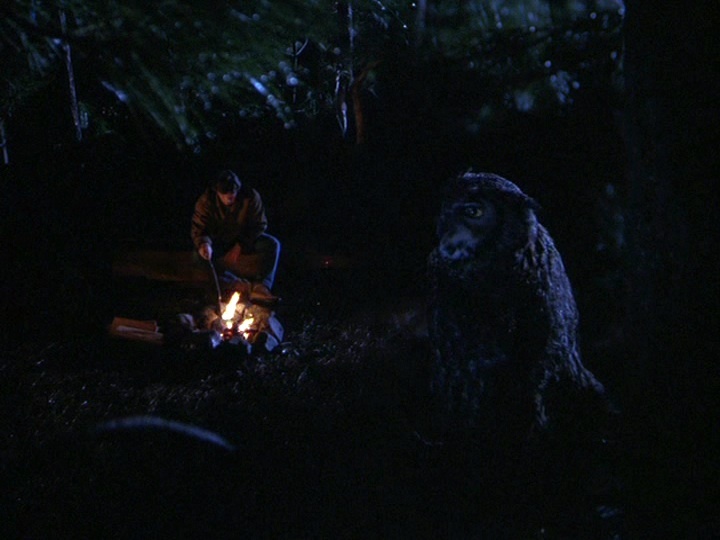 – In Rick’s death scene, we see an owl. In Western cultures, the owl symbolizes wisdom, but in many other cultures (including in Kenya, and some Native American cultures) the owl is seen as a harbinger of death. While Rick’s death is sad, the way he went out is special, unique and (quite literally) otherworldly. We are reminded of Maurice’s fear of “going out with a whimper instead of a bang.” Rick very much went out with a bang. And so we come to the funeral scene. Maggie seems to be the only one dressed in black (as is Chris, but as we saw in 1.4, the black turtleneck seems to be his nod to being a minister of sorts). The rest of the residents are in formal-leaning clothes, of all colours. The coffin arrives, to the mournful but whimsical song “Il teatrino della” (meaning “the theatre of”) from Fellini’s 1965 Juliet of the Spirits. The black coffin is large, awkward, unwieldy, with long metal antennae from which silver balls, and something that looks like a colander, stick out. The pallbearers have a hard time of it, stumbling and almost poking people in the eye. The coffin is put in its place in front, and it is so tall that the flowers on top obscure the 6 foot 5 Chris. 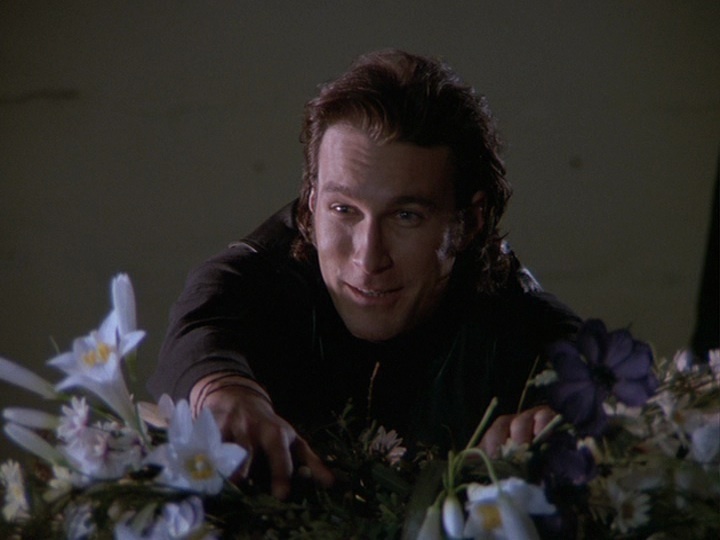 He has to part the flowers to see the attendees, and it is this moment the people are no longer unable to contain their laughter. The absurdity of the situation overwhelms and the whole room bursts out laughing after the furious Maggie leaves the church. “African cultures tell lascivious tales about the deceased, and in South America, former Surinam slaves have a story-telling feast that can go on for two weeks,” Bonanno explained. Balinese mourners also smile and laugh during funerals, and the Hopi Indians encourage the bereaved to cry alone. Whether you laughed with the Cicelians or not, you can’t deny that some tension and grief were released at that merry moment. 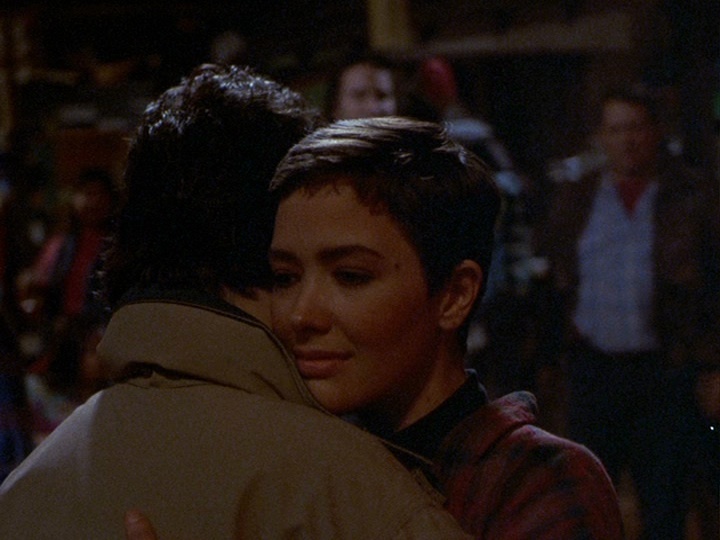 The episode ends with the townsfolk dancing to Etta James’ “At Last.” This moment is a momentous one in the evolution of Maggie and Joel’s relationship (he is, after all, seemingly the only one able to make her feel better amidst the town’s paranoia about her), but it is also a scene that reassures viewers and makes them feel sentimental and warm. Is it coincidental that the last few lines of the song include: “And here we are in heaven / For you are mine / At last.” Like in “Sugar Moon” we have a reminder that perhaps Rick is happy in heaven, where (perhaps as Maggie suggests in the first scene when she muses on them going away) “they warm the towels”. No matter how you think the comedic approach to death worked (and I’m looking at you, Shane), you gotta admire the ambitiousness of it, right? The Good: It was wonderful to be introduced to Ron and Erick amidst show tunes and balsamic vinegar, as well as seeing them cut a rug. 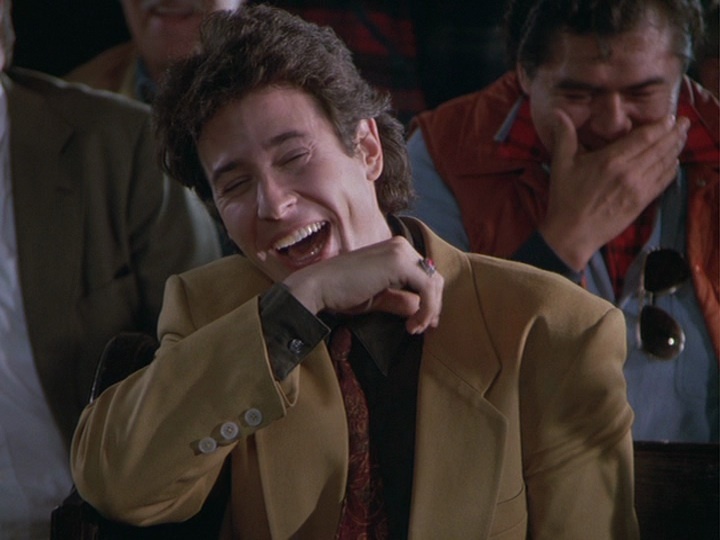 Rob Morrow’s performance is great in this episode, especially when telling the joke about crawling up on a roof and during the last scene with his Chris-like speech and slow dance with Maggie. The Bad: When Holling tells Shelly that he loves her for her body, we see it as less sweet and reassuring than it’s likely intended to be. 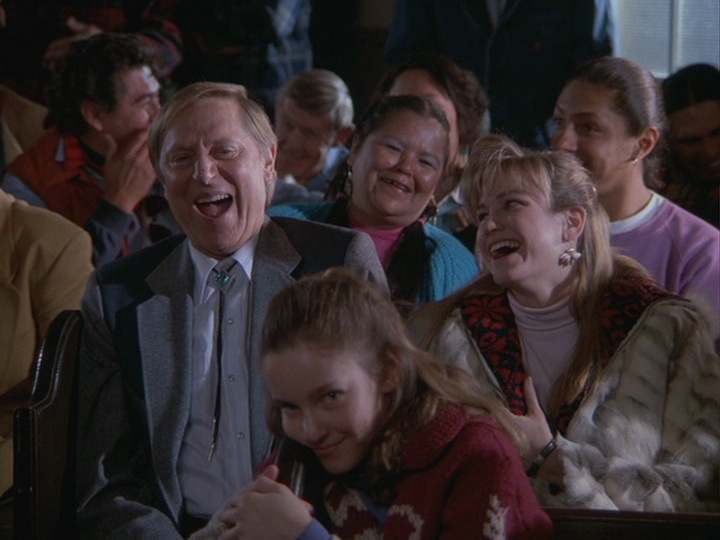 Normally, we don’t find the relationship between Shelly and Holling to be creepy, but here we do, a little. The Notable: The names of Maggie’s dead boyfriends are slightly different in this episode than mentioned in “What I Did For Love.” Why wasn’t Roy’s death-by-sushi mentioned by Chris? (Clearly, there was a writing gaffe.) We also get to see the melted-crayon skeletal figure Maggie has made for Rick to add to her diorama. The red plane and red wind sock are a nice touch. 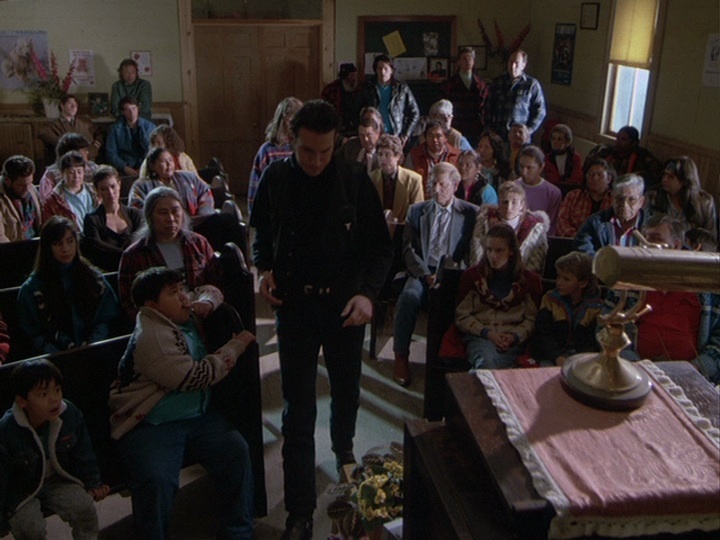 The laughing scene when Rick’s coffin comes in is my favorite Northern Exposure scene of the whole series. 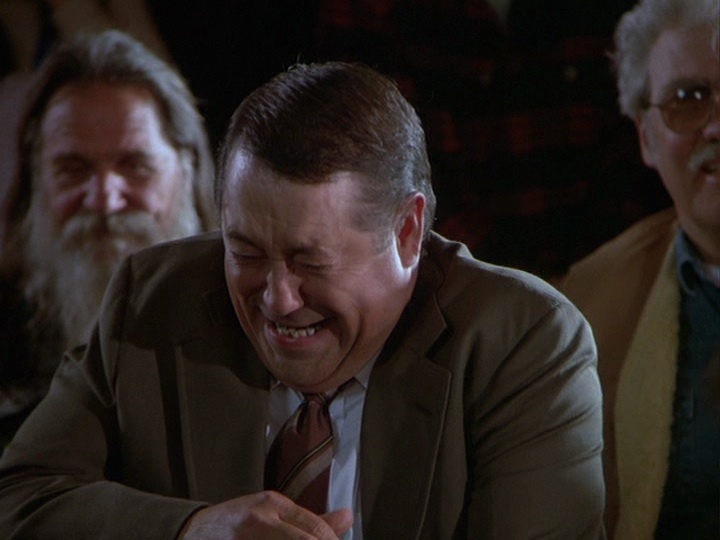 The actors trying to stifle their laughs and then bursting out seemed so genuine, it has always made me wonder how they achieved it so naturally. I think it speaks to the weirdness of the whole series, the whole premise was absurd, but like you said…..it works.